To avenge the death of his younger sister, Tooru Kokonoe enters the prestigious Koryo Academy, a high school dedicated to training its students to wield Blaze—individualized weapons that are manifestations of one's soul. While the future of a student is often determined by the form their weapon takes, Tooru is an Irregular, whose Blaze appears as a shield instead of a melee weapon. How can Tooru possibly learn to use his defensive abilities to fight effectively? That's when the Duo system comes in, a program where students are paired up as battle mates, classmates, and roommates. Tooru's is paired with a silver-haired girl from Scandinavia named Julie Sigtuna, who possesses a power the likes of which has never been seen, and shares his thirst for revenge. 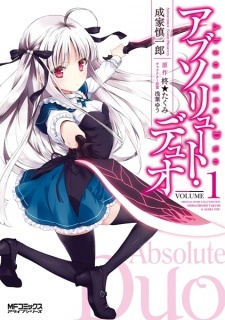 Absolute Duo has been published in English by Seven Seas Entertainment since August 29, 2017.